One of the first things you learn when you start programming is that, just like any craftsperson, your tools matter. Notepad.exe isn’t going to cut it. A powerful editor and testing pipeline supercharge your productivity. I still remember learning to use Vim for the first time and being able to zip around systems and complex programs. Do you remember how hard it was to setup all your compilers and dependencies on a new machine? How many cycles have you wasted matching versions, tinkering with configs, and then writing documentation to onboard a new developer to a project? The Ace Editor at the core of Cloud9 is what lets you write code quickly, easily, and beautifully. It follows a UNIX philosophy of doing one thing and doing it well: writing code. It has all the typical IDE features you would expect: live syntax checking, auto-indent, auto-completion, code folding, split panes, version control integration, multiple cursors and selections, and it also has a few unique features I want to highlight. First of all, it’s fast, even for large (100000+ line) files. There’s no lag or other issues while typing. It has over two dozen themes built-in (solarized!) 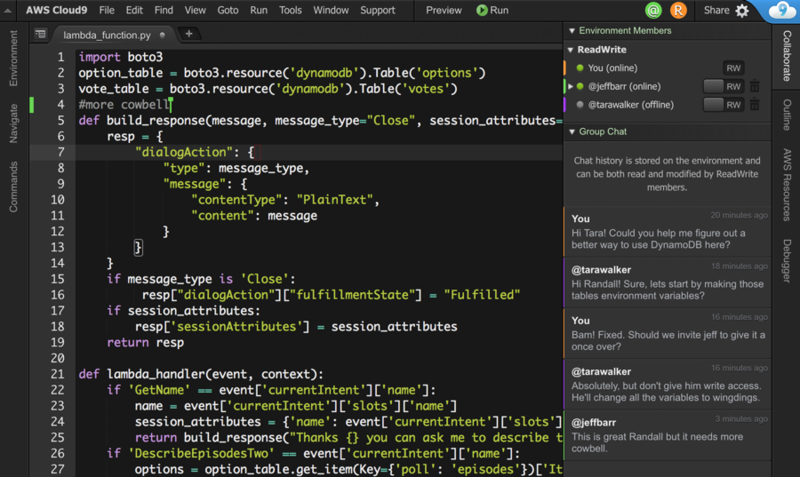 and you can bring all of your favorite themes from Sublime Text or TextMate as well. It has built-in support for 40+ language modes and customizable run configurations for your projects. Most importantly though, it has Vim mode (or emacs if your fingers work that way). It also has a keybinding editor that allows you to bend the editor to your will. 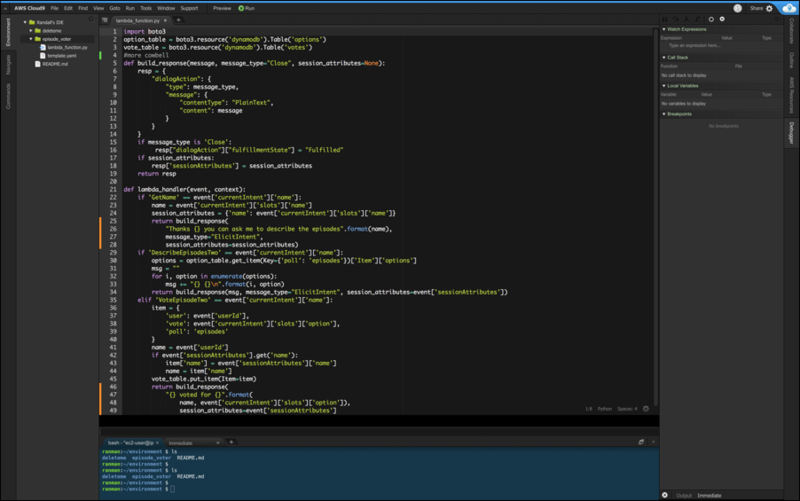 The editor supports powerful keyboard navigation and commands (similar to Sublime Text or vim plugins like ctrlp). On a Mac, with ⌘+P you can open any file in your environment with fuzzy search. With ⌘+. you can open up the command pane which allows you to do invoke any of the editor commands by typing the name. It also helpfully displays the keybindings for a command in the pane, for instance to open to a terminal you can press ⌥+T. Oh, did I mention there’s a terminal? It ships with the AWS CLI preconfigured for access to your resources. The environment also comes with pre-installed debugging tools for many popular languages – but you’re not limited to what’s already installed. It’s easy to add in new programs and define new run configurations. The editor is just one, admittedly important, component in an IDE though. I want to show you some other compelling features. 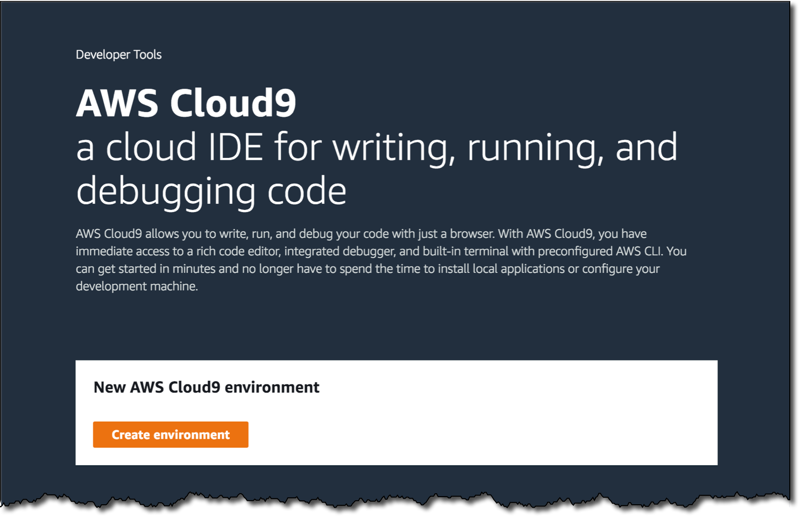 The AWS Cloud9 IDE is the first IDE I’ve used that is truly “cloud native”. The service is provided at no additional charge, and you only charged for the underlying compute and storage resources. When you create an environment you’re prompted for either: an instance type and an auto-hibernate time, or SSH access to a machine of your choice. If you’re running in AWS the auto-hibernate feature will stop your instance shortly after you stop using your IDE. This can be a huge cost savings over running a more permanent developer desktop. You can also launch it within a VPC to give it secure access to your development resources. 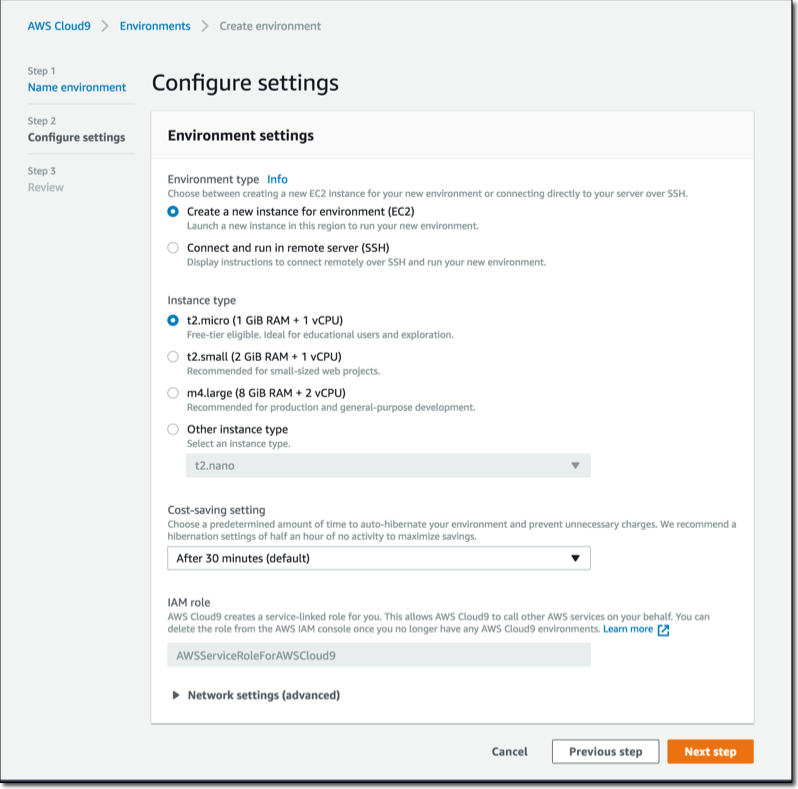 If you want to run Cloud9 outside of AWS, or on an existing instance, you can provide SSH access to the service which it will use to create an environment on the external machine. Your environment is provisioned with automatic and secure access to your AWS account so you don’t have to worry about copying credentials around. Let me say that again: you can run this anywhere. I spend a lot of time on Twitch developing serverless applications. I have hundreds of lambda functions and APIs deployed. Cloud9 makes working with every single one of these functions delightful. Let me show you how it works. 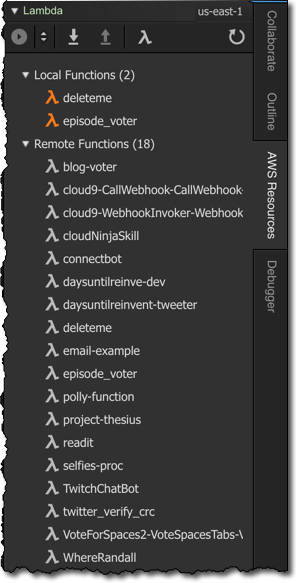 If you look in the top right side of the editor you’ll see an AWS Resources tab. Opening this you can see all of the lambda functions in your region (you can see functions in other regions by adjusting your region preferences in the AWS preference pane). You can import these remote functions to your local workspace just by double-clicking them. This allows you to edit, test, and debug your serverless applications all locally. You can create new applications and functions easily as well. If you click the Lambda icon in the top right of the pane you’ll be prompted to create a new lambda function and Cloud9 will automatically create a Serverless Application Model template for you as well. The IDE ships with support for the popular SAM local tool pre-installed. This is what I use in most of my local testing and serverless development. Since you have a terminal, it’s easy to install additional tools and use other serverless frameworks. With AWS CodeStar you can easily provision an end-to-end continuous delivery toolchain for development on AWS. Codestar provides a unified experience for building, testing, deploying, and managing applications using AWS CodeCommit, CodeBuild, CodePipeline, and CodeDeploy suite of services. 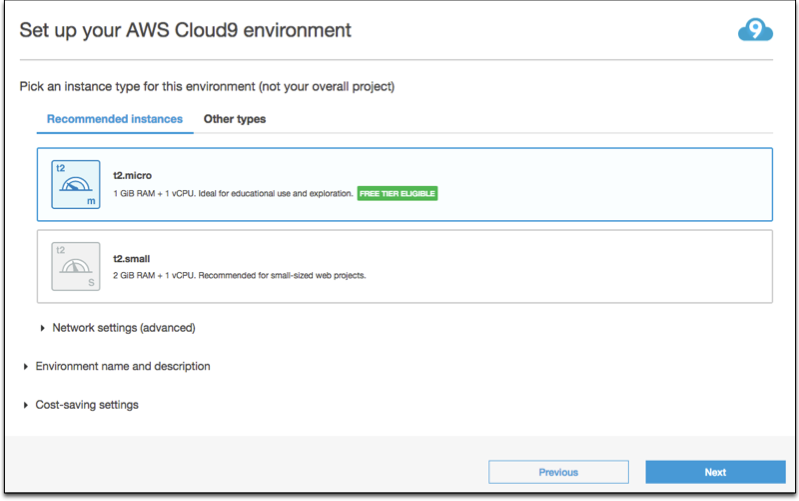 Now, with a few simple clicks you can provision a Cloud9 environment to develop your application. Your environment will be pre-configured with the code for your CodeStar application already checked out and git credentials already configured. You can easily share this environment with your coworkers which leads me to another extremely useful set of features. One of the many things that sets AWS Cloud9 apart from other editors are the rich collaboration tools. 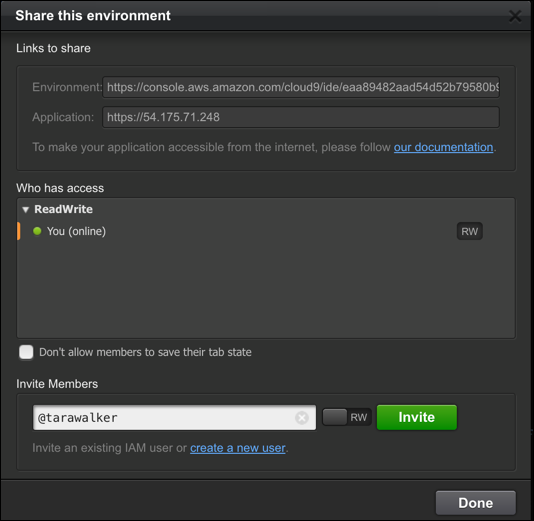 You can invite an IAM user to your environment with a few clicks. You can see what files they’re working on, where their cursors are, and even share a terminal. The chat features is useful as well. There are no additional charges for this service beyond the underlying compute and storage. c9.io continues to run for existing users. You can continue to use all the features of c9.io and add new team members if you have a team account. In the future, we will provide tools for easy migration of your c9.io workspaces to AWS Cloud9. AWS Cloud9 is available in the US West (Oregon), US East (Ohio), US East (N.Virginia), EU (Ireland), and Asia Pacific (Singapore) regions. I can’t wait to see what you build with AWS Cloud9!